Over 400 of you went through the draft set of inputs uploaded a few weeks ago and many of you sent me additional points either via comments or via email, thank you very much for taking the time off to think about the subject and to revert with your own inputs. I'd also like to thank my band of co-contributors who drew on their experience from fields as diverse as landscape engineering, software architecture and marine engineering to come up with highly detailed inputs. All your inputs were compiled and have been sent across to the powers-that-be for their consideration. Apologies for the delay in uploading the final version, as I was on a two-week long business trip that spanned six countries including India. That's a separate story altogether, but I am hoping that some good news for Trivandrum may come out of it in the next few weeks and months. As many of you may already be aware of, the new draft Master Plan for Trivandrum is ready - after a gap of over a quarter of a century, the one in force today dates back from 1984 or so! The plan has been published on the website of the Trivandrum Corporation, for the general public - you and me - to review and submit our suggestions. A word of caution, the hefty 24 MB document has nearly 400 pages, so it may take some time to go through it! The Corporation and the Town Planning Department, which authored the draft, recently also conducted a seminar to provide a venue for suggestions to be aired. Together with a number of like-minded friends, I have compiled a list of inputs to improve the draft and make it into a true vision-setting and operational document that can help set Trivandrum on the course to be a world-class city rivaling Singapore - the best benchmark for us - within a decade. The document is below, for your review. Here are some of the salient points in the document for a quick review. As mentioned above, a formal Trivandrum Metropolitan Area (TMA) has to be established by due process by the State Government. The master plan must act as both define this area and set the direction for development within it. · In terms of providing increased density – over and above KMBR, it is best that this be focused in relation to transportation availability and economic activity. · It is recommended that density incentives be provided to areas located along primary transportation axes such as the NH-66 (Attingal to Vizhinjam), old NH-66 (between Kazhakkoottam and Kaliyikkavila), M.C. Road and other 4/6 lane roads within the metro regions, as well as along the proposed route of the mass transit system (not just the current alignment but along the entire network as proposed in Section 3). The latter promotes Transit-Oriented Development (TOD) and will help improve the viability and effectiveness of the MRTS network. These density incentives may be up to 1.5-2 times the FAR prescribed in KMBR for each use but must be accompanied by stringent parking requirements. A single mass transit route will not suffice for a metro area the size of Trivandrum with well over 700,000 daily trips. The master plan must incorporate a comprehensive mass transit network that serves the entire metro area. This will be based around a multi-route mass transit system (viz the monorail) but also incorporate other modes of transport such as commuter rail, water transport and buses. 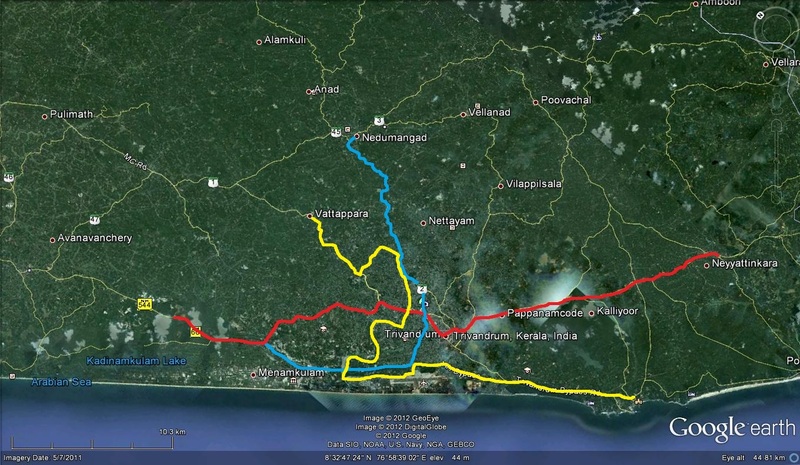 Route 2: Kazhakkoottam – Aakulam – Airport (Chackai) – Pettah – Palayam – Vellayambalam – Peroorkada – Nedumangad (It could terminate at Peroorkada in Phase I). Route 3: Vizhinjam – Kovalam – Eanchakkal – Airport – Kochuveli – Veli – Aakulam – KIMS - Medical College – Pattom – Kowdiar – Peroorkada – Civil Station– Manathala – Vembayam. An integrated water supply system to cover the entire metro area has to be established. This needs to be immediately rolled out to cover the newly added areas of the corporation but also to the outlying areas of the metro areas, with new systems in areas currently not covered and by linking together existing stand-alone systems. The current 300 MLD capacity of the city’s water system has to be progressively increased to 500-600 MLD within the next 5 years. This will involve setting up additional processing capacity and also tapping new water sources such as the Neyyar and Peppara dams. Considering even a water return volume of 50%, the city will need at least 250 MLD of sewage processing capacity in a few years, with the current STP at Muttathara having a capacity of only 107 MLD. A second STP of 150 MLD capacity (two phases of 100 and 50 MLD) is therefore proposed within the Veli-Kazhakkottam Industrial Estate. In the next 10-15 years, power consumption in the metro area is likely to reach the 2500 Kwh/person/year level seen as a global average (and already in emerging markets such as China). This will necessitate about 1000 MW of generation capacity to meet the needs of the metro area and very likely much more if we take the increasing scale of commercial and industrial activities into account. A gas turbine power plant, fueled by natural gas from an LNG import terminal built at Vizhinjam will be the ideal choice to meet this need. The power plant can be developed in two phases of 1000 MW each and the excess power exported to the rest of Kerala/India. Vizhinjam is the best-suited port in India for LNG import because of its proximity to gas sources such as Australia, Indonesia, East Africa, the US and Russia, as well as its deep draft. An LNG terminal at Vizhinjam can be leveraged for a metro area wide gas distribution network as well as conversion of vehicles to cleaner CNG, starting with government and public transport vehicles. The availability of gas will also promote the development of micro-grids which are localized, interconnected loads such as buildings within a campus that share power generation and chilling capacity. This arrangement is very cost-effective, efficient and resilient (in case of grid failure). 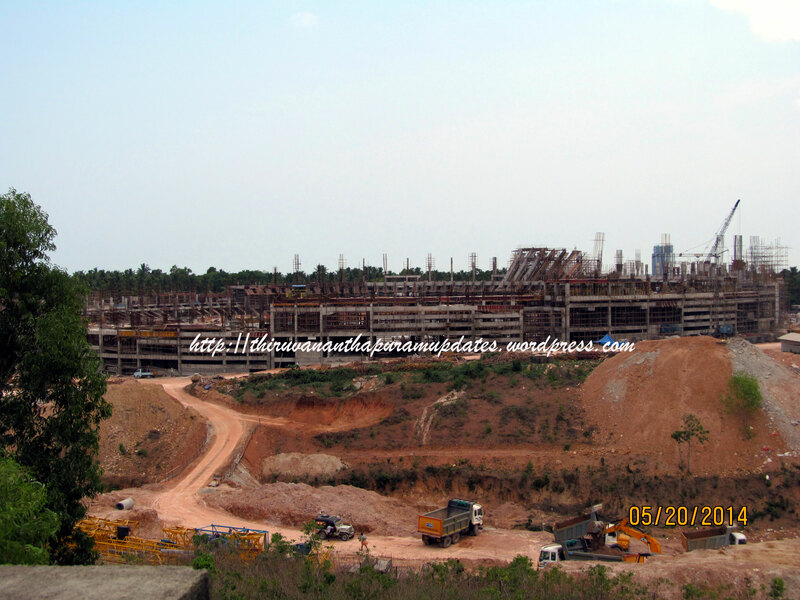 Economic development - salient projects recommended include an international convention and trade center (under the landlord model of development), world-class logistics facility for Vizhinjam, Aerospace manufacturing cluster, Knowledge City and a strategic land bank for major economic development projects. Raise funds for development projects by the issue of bonds, raising debt from development finance institutions (World Bank, ADB, JICA et c) and from commercial lenders and by levying fees/taxes. Periodically update the master plan (minor revisions once every two years, major updates every five years). and act as it custodian. The TMDA must have a specialized economic development wing, modeled along the lines of the New York City Economic Development Corporation (NYCEDC) that creates strategic visions and plans, formulates project proposals, raises funding, oversee project execution and, promotes and facilitates private investment. With the massive volume of transportation infrastructure development planned in the next 10 years and the ever-growing transportation volumes in the metro area, a dedicated agency is called for to integrate the development and operation of all modes of transportation. This will be the Trivandrum Metropolitan Transportation Authority (TMTA). As I mentioned in the beginning, these are but a select few of the points in the document. The Town Planning department is accepting suggestions till June 6, and I will make sure that the cumulative set of inputs makes it to the right decision makers and is given due consideration, if all of you could chip in with your points by June 4 via email or the comments facility here. Remember, each of us has a different perspective on our beloved city and a different set of experiences and backgrounds, so we may each have at least one more point to add. More the merrier, so don't hesitate, the next time a chance like this comes along may be in 2038 (let's hope it comes a lot sooner than that! ).